I spent quite a bit of time with my grandparents when I was growing up so this is a meal I became quite familiar with for dinner. 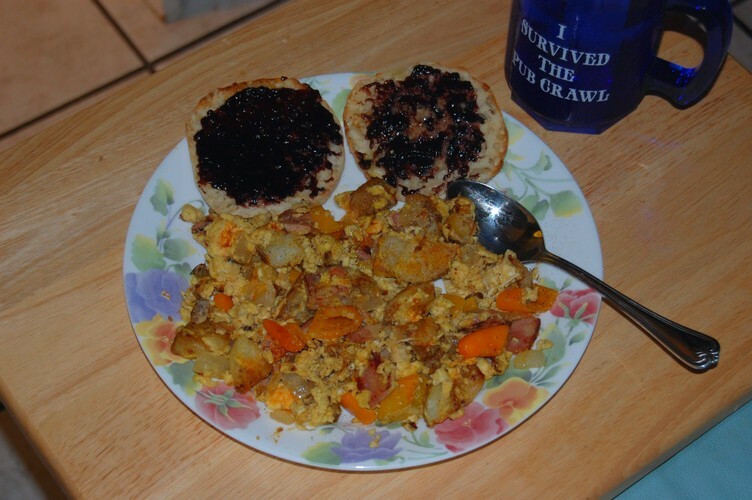 My grandfather sometimes called it scrambled egg mess but it is straight from the lean days of the Depression. Usually it contained no meat, however you could include some ham or spam if you had some on hand. Otherwise it was made of 3 ingredients that were rather cheap back then and even cheap now, Onions, Potatoes and Eggs. Ofttimes it was made of leftover baked potatoes from dinner the night before but it was a great way to feed a family for a little bit of money. Heat a heavy frying pan and add about 3T lard, or more if needed. When good and hot add potatoes and fry until well browned. Add onions and fry until transparent. Add meat if using and warm through. Whisk eggs in bowl and add to pan stirring often until eggs are cooked through. Season with salt and pepper to taste. Serve with toast points with butter and jelly. Onions and eggs were our not meat on Friday's dish for many years when I was growing up in the 60s. Sometimes a few potatoes would be thrown in or, potato and eggs with any stray onions. Actually, peppers and eggs were my personal favorite! Thanks for the memories and for sharing:) I may just make some peppers and eggs this Friday! Come to think of it, that's when my grandparents seemed to cook it as well. I don't think my grandfather liked fish too much, I don't remember him eating it very often. The beauty of this dish is to throw in what you like, sometimes I add some chopped garlic or as you mentioned, peppers.